Finally, a metal polish thatï¿½s all-natural and easy to use! Cleaning and polishing your RVï¿½s bright work doesnï¿½t have to be a messy, laborious task thanks to McKeeï¿½s RV Metal Brightening Soap. If you are like a lot of people that have sensitivity to chemicals, rest assured the metal polish youï¿½ve been waiting for is finally here. This non-toxic soap relies on smart chemistry instead of high-octane cleaners like ammonia, a common ingredient in other metal polishes. McKeeï¿½s RV Metal Brightening Soap cleans, shines and restores the appearance to stainless steel, aluminum and diamond plate surfaces. McKeeï¿½s RV Metal Brightening Soap polishes and protects in one simple step! Consisting of silicate-free polishing clay and all-natural soap flakes, McKeeï¿½s RV Metal Brightening Soap forgoes the nasty, caustic ingredients found in a conventional metal polish and relies on eco-friendly ingredients. Polishing metal used to be messy, and you often found yourself dizzy when the job was completed due to the toxic chemicals found in most metal polishes. McKeeï¿½s RV Metal Brightening Soap makes it easier than ever to restore dull, spotted, or tarnished metal surfaces to a mirror-shine. Youï¿½ll find a million-and-one uses for McKeeï¿½s RV Metal Brightening Soap inside and outside your RV. Use it to polish your exhaust to a mirror finish, remove soap scum and stubborn dish soap residue from your stainless steel sink, and polish your wheels to a finish so bright they will shine like chrome! 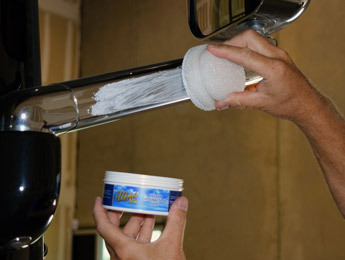 McKeeï¿½s RV Metal Brightening Soap is arguably the easiest RV detailing product youï¿½ll ever use. Simply wet the included sponge and rub it back and forth across the soap until a thick lather is produced. 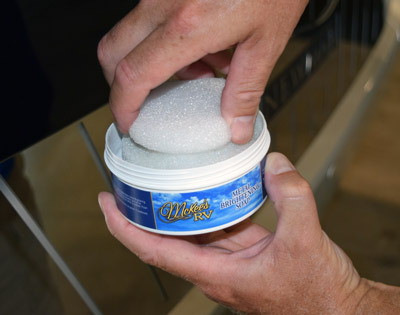 Then, take the sponge and polish your RVï¿½s bright work to a mirror finish. Treated surfaces will be clean, shiny and well protected thanks to the anti-corrosive agent found in Metal Brightening Soap.